Furniture has a specific relationship to the individuals it is used by and to the space in which it resides. The space in which we live is determined by the shapes which fill the negative space. When put under a micro-lens it becomes clear that furniture is a response to the time in which it was created. 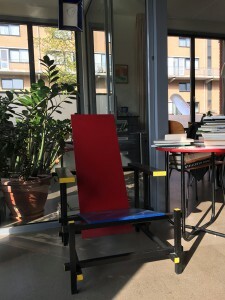 Henk: This red and blue chair came from my father, he bought it in 1963. 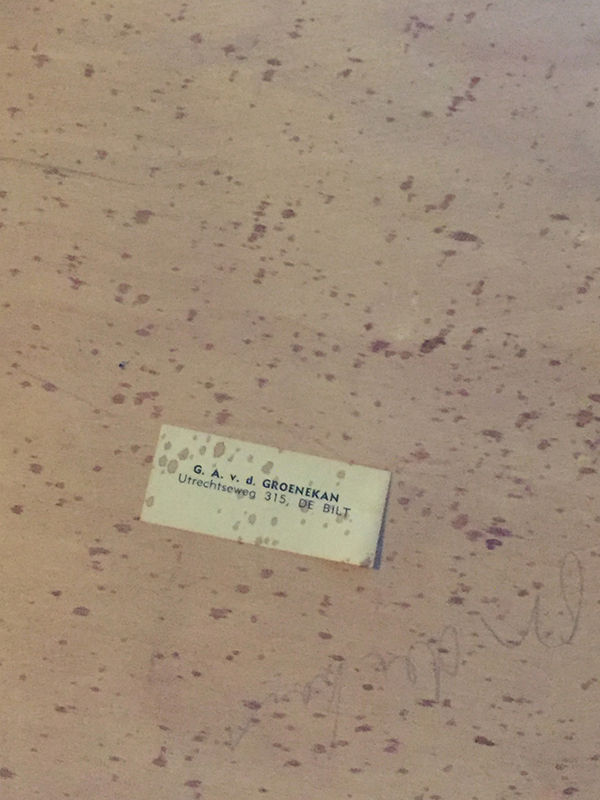 He got this just in time to brand it an original Rietveld chair (Rietveld †1964). The models he made, you could say, were almost prototypes, he just tried out all sorts of things. He made a few for the houses in that time and these are considered very original (vintage) and are now very expensive, most of them are in museums. Me: So, this exact chair could be in a museum? 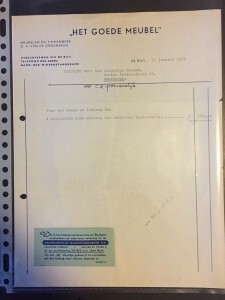 Henk: Yes, because everything is considered real on it. It is his design, made by his carpenter. Me: Do you know why your dad wanted to buy it? Henk: Ja, because he was fascinated by it. He was a very good friend of the director of the Stedelijk at the time and they probably talked about it. He was a dentist and an art collector. Me: But did he use it, as a chair? Henk: Yes, he always sat it in it. He had it in the corner of his study and always sat in it when he was reading. You can see it it is used. He said it was very comfortable. But now I have it, and I hesitate. I’m just more careful with it. Me: Maybe also because it comes from your father, and it is such a collectors’ item now. Henk: Yes, I think so. I don’t know. I don’t really dare to sit in it. But maybe if I had a bigger house or more space, less children I would. But yes, that’s it. It’s nice no? It’s really special to have something that’s so original. Ben: At home I have the so called Steltman chair. 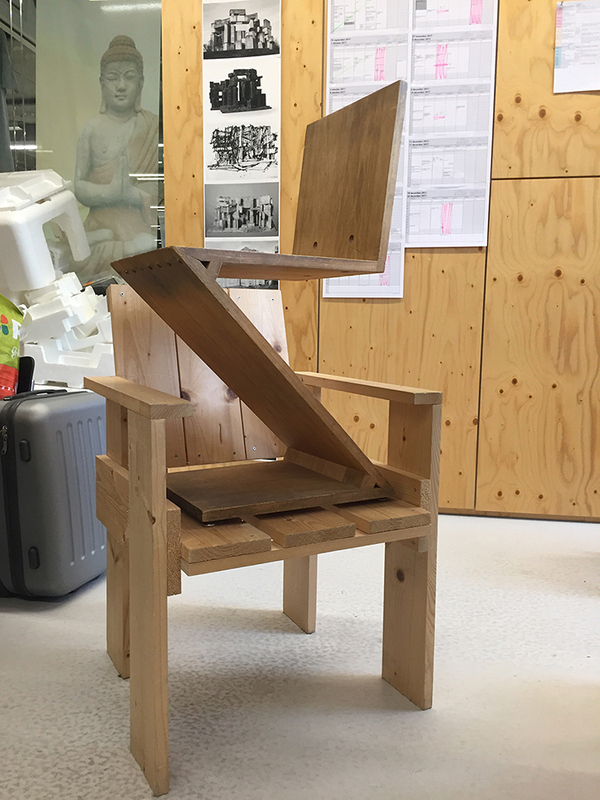 And it was made here (Gerrit Rietveld Acadmie) by Eve, and she also makes these zig-zag chairs…Rietveld of course, was very interested in simple constructions. But most of all he was interested, not so much in the object, but in the space, and how the material defines space. 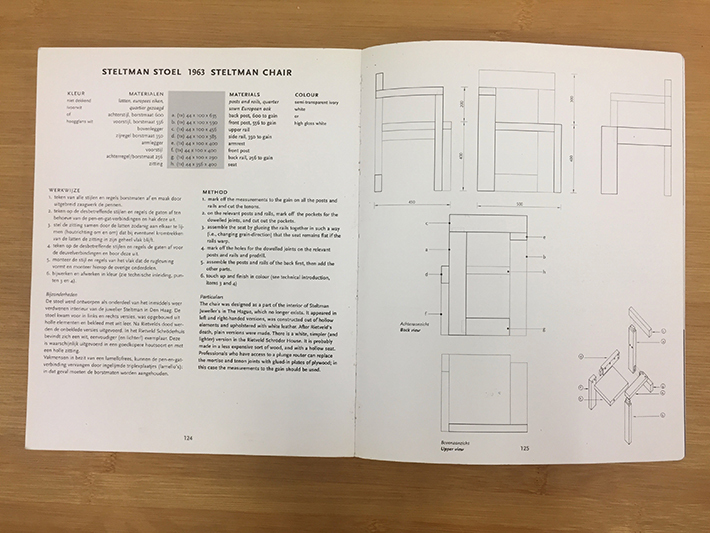 A chair is often symmetrical, this Steltman chair is not. Me: Where do you have the chair in your home? Ben: He draws a map, and points to a room… Sometimes I’ll put it in the middle of the room… Rietveld doesn’t care about sitting at all, if he did he would have done it completely differently I guess. But what’s important is the size, because that’s what relates to our body and it’s an easy way to deal with space in a limited site. But what is so interesting about this chair being nonsymmetrical is the way it connects to the floor. Like many of his other pieces, it’s all done from the same piece of wood as it were. Its cut up in different lengths and put together in a certain way. But it’s all describing space as it were; up, down, around, through, etc. Originally for Steltman Jeweler it was hollow, but I have a solid version. Me: And do you ever sit on yours at home? Ben: Yes, I do. Because it’s quite low, and it’s not a big chair. But it’s not very comfortable to sit in for long, it’s a good one to make a phone call. I can imagine it being next to a phone, an old-fashioned phone which no body has anymore. What is most important in this Steltman chair, is the void, the space. 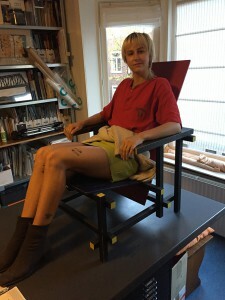 There is a big difference between the chairs, the Crate chair is especially made so that everyone can make it. You don’t need anything, just a few screws. 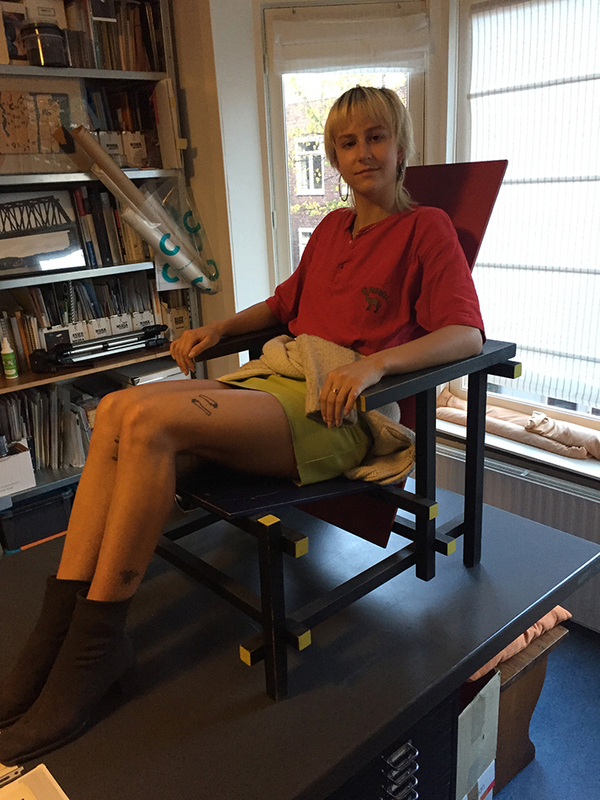 Me: So, this is your red and blue Rietveld chair. Frans: Yes, and it’s a perfect chair for reading a book. Because somehow if you’re reading here (on a sofa) you slip away, but on the Rietveld, you remain somehow a little bit more alert. Me: Where did you get it from? 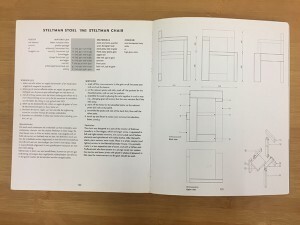 Frans: I knew Groenekan (†1994) the carpenter of Rietveld, and he gave me the drawings and then another carpenter made it. Me: Why is it important for you to be surrounded by this style of furniture? Frans: It is open, it is light, you can look through it. It’s not an obstacle. Its rather comfortable, but you still remain a little active. And for the eye. This is why I like the Rietveld chair, the construction is so visible. So, you see how it has been constructed… (The word) design to me has a little bit a bad connotation. All the design that you see now is all edelkitsch. 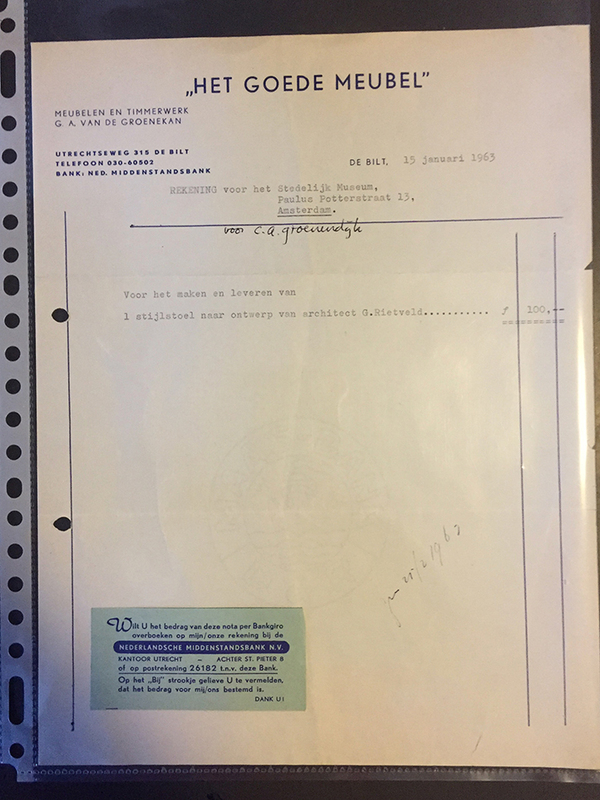 And what to me is very important, and what to Rietveld was very important, is this visibility, openness, and that you can see the construction. Now design is very much decorative. Me: It’s about the relationship between form and content. 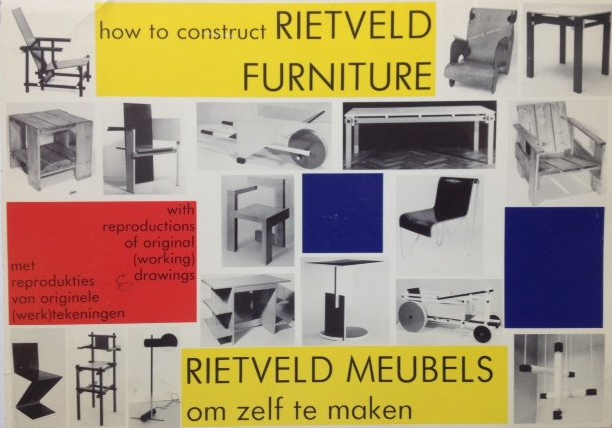 Through these dialogues and conversations, I came to a critical understanding about Gerrit Rietveld; his furniture is a visual representation of his ideology. Space, light, and visible structures were meant to bring a working class of people into a better, brighter way of life. His forms reflected and supported his content; his ideals. And this relationship between form and content is the underlying support system in Rietveld’s work. The way his furniture is perceived today is an intrinsic paradox; a paradox anyone can see if they only ask the right questions.